Even cats get grumpy with colds. If your feline friend has the sniffles it's worrying, even though he may only have a simple cold. Kitty can't tell you how bad he feels, though, so understanding when a cough could be something more serious helps you get him the right treatment. Cats suffer from similar cold viruses to humans, and they have similar symptoms such as runny noses, sneezing and watery eyes. Colds aren't usually serious illnesses in cats, but if your cat suffers from worrying symptoms, such as a cough or difficulty breathing, it's worth consulting a vet. Other symptoms include making a grunting noise when breathing and bloody mucus. Kittens and older cats should pay a visit to the vet if symptoms last longer than a day. Pneumonia is inflammation of the lungs. Bacterial pneumonia is caused by a lung infection and symptoms include fever, loss of appetite, weight loss, sluggishness and dehydration. Other symptoms are related to poor lung function, such as rapid, difficult breathing and coughing. Your cat may feel so weak he doesn't want to move anywhere. Bacterial pneumonia is a serious infection and requires a trip to the vet, appropriate treatment and a period of recuperation. 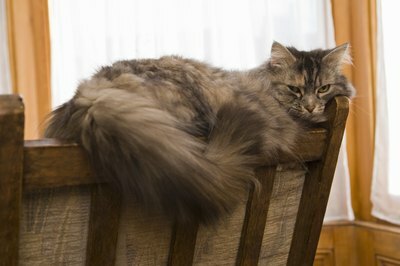 If your cat inhales a foreign object, or his stomach acids or vomit, he could develop aspiration pneumonia. Obstruction of his airway or damage to his lungs causes them to become inflamed. Symptoms include difficulty swallowing, vomiting, a fast heart rate and bluish-tinged skin. He could also cough, breath quickly, have difficulty breathing or run a fever. A vet should always check symptoms of aspiration pneumonia. As well as following your vet's advice, you can help alleviate your cat's symptoms by keeping him warm and dry, and providing him with plenty of fresh, clean water. His sense of smell is reduced when he has a cold, so stimulate his appetite with moist, fishy food. It's best to not allow him outside during cold weather, as cold air dries out his nasal passages and encourages infection. What Is the Best Out of Cage Time for a Parakeet? Do Cats Breathe Funny When They Purr? What Is the Behavior Behind the Obsession With Food of a Dog? How Does Declawing Hurt Cats? Are Bull Mastiffs Predatory Towards Cats?